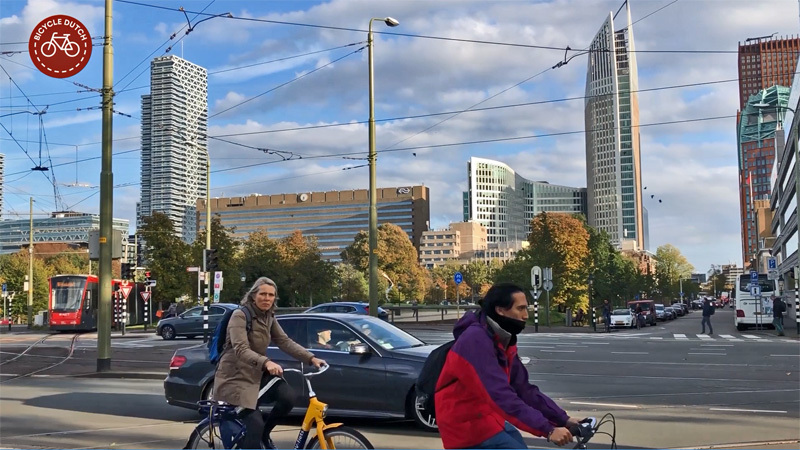 People cycling near the central station of The Hague in the afternoon rush hour, that is the theme of this week’s post. 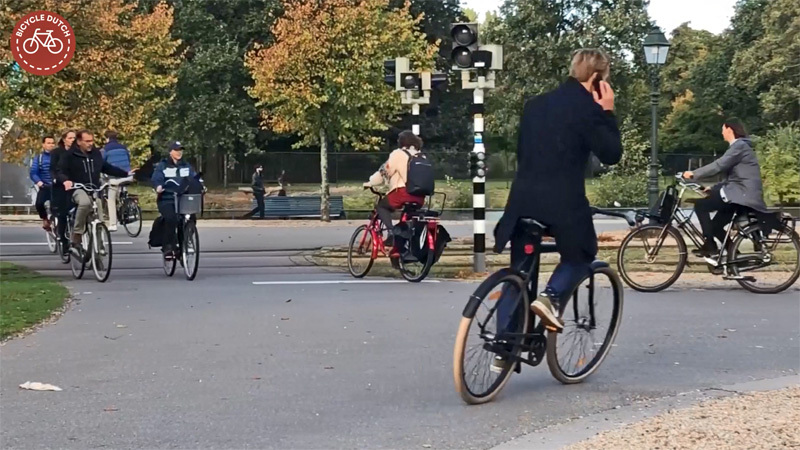 When I was early for an evening meeting* in the city last week, I had half an hour to film the people passing by in the park in front of the station, where we find an intersection between several cycle routes and also a tram track crossing. Some highrises in the skyline of The Hague. In the distance behind the woman the concrete right-angled building is Central Station. Most shots in the video are from the area with the trees right in front of it. The Hague is the third-largest city in the Netherlands with well over 534,000 inhabitants. Only Amsterdam and Rotterdam are bigger. Utrecht is the forth-largest. These four cities form the four corners of the Randstad Conurbation. While Amsterdam and Utrecht form the north-wing, Rotterdam and The Hague form the south-wing which is home to about 3.5 million people. In Dutch the city has two names: ʼs-Gravenhage (literally “The Count’s Wood”) and Den Haag “The wood”. Very similar to my hometown, that has the names ʼs-Hertogenbosch (literally “The Duke’s Forest”) and Den Bosch “The forest”. The difference being that in 1990 The Hague chose to use the short form mostly (except in official papers that require the legal longer name) whereas ʼs-Hertogenbosch chose to make the long form the official name. 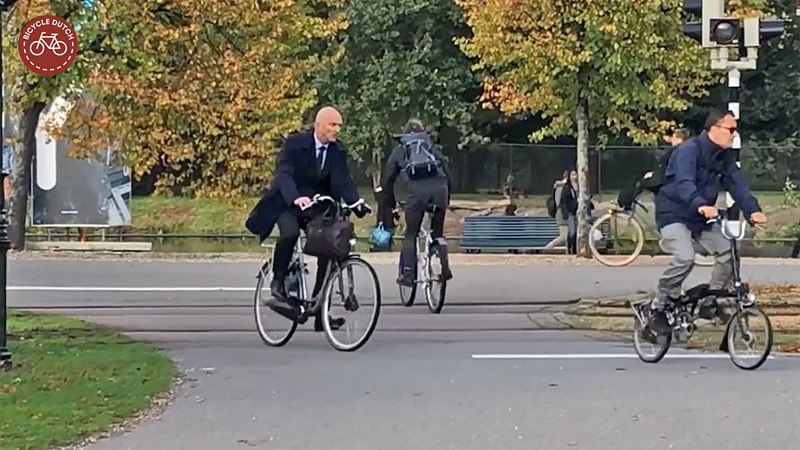 It’s good to see that people of all ages and backgrounds cycle in The Hague, as may be expected in a Dutch city. Also note the bright autumn colours of the trees in the background. Although it can look busy at times and people seem to come from all directions, it never looks or feels intimidating at this location, not even in rush hour. The Hague is the seat of the cabinet of the Netherlands, the States General, the Supreme Court, and the Council of State, but the city is not the constitutional capital of the Netherlands, which is Amsterdam. Most foreign embassies in the Netherlands and 150 international organisations are located in the city, including the International Court of Justice and the International Criminal Court, which makes The Hague one of the major cities hosting a United Nations institution along with New York City, Geneva, Vienna, Rome and Nairobi. King Willem-Alexander lives in Huis ten Bosch and works at the Noordeinde Palace in The Hague, together with Queen Máxima. The Hague is also home to the world headquarters of Royal Dutch Shell and other Dutch companies. The Hague is indeed a very international city. This is reflected in the number of ex-pats you can see in the streets. They do cycle, and one of them even told me that very evening how much better cycling in The Hague is compared to what they’re use to, but it is also clear that a number of these ex-pats brought their cycling habits from their home countries with them. One of the passers-by in the video is in a hi-viz jacket and wears a plastic hat on a virtually upright bicycle. That man definitely looks like an ex-pat! For the Dutch cycling in The Hague is a little less attractive and convenient than average. I am always surprised by the number of streets and intersections that have mixed traffic. Even this night I cycled at places where I literally thought: “Is this really the place where they expect me to cycle now?”. That is reflected in the numbers. There is much more cycling in Utrecht and Amsterdam than there is in Rotterdam and The Hague. The figures show The Hague in third place of the four largest cities regarding cycling as a percentage of all trips (see figure). 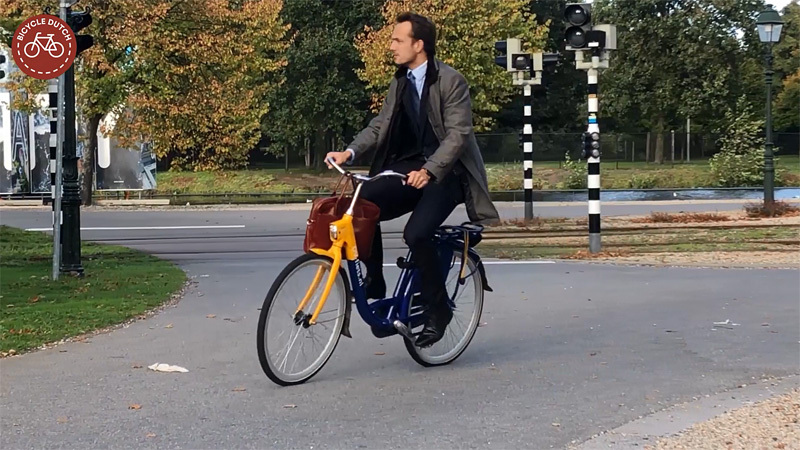 The figures for commuter trips, (to and from work) have been published in a recent report from the KiM (Knowledge institute for Mobility policies) a Dutch Governmental Agency of the Ministry of Infrastructure and the Environment. When you compare Utrecht to The Hague you see quite a few striking differences. 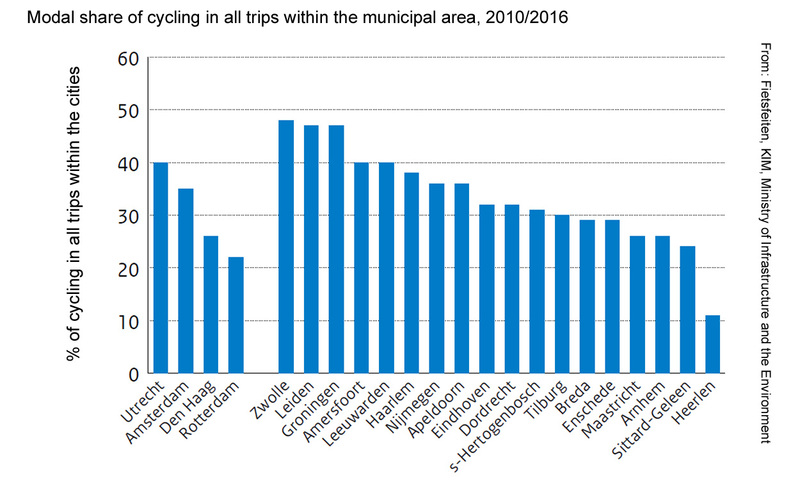 The number of cycle trips is much higher in Utrecht (13% more trips by bicycle) but the number of trips in Public Transport is again much higher in The Hague (11% more trips by PT). The numbers for car trips are much closer together, 31% in The Hague versus 29% in Utrecht. (The cycle trips in Amsterdam are 48% of the total commuter trips, for Rotterdam it is 31%. The number of commuter trips by car in Amsterdam is 21%, for Rotterdam it is 38%). Comparing the modal share of cycling in 22 larger cities of the Netherlands. It is clear that The Hague belongs to the cities with least cycling of this group. The city comes right after Enschede and is equal to Maastricht and Arnhem. Graph: KiM. 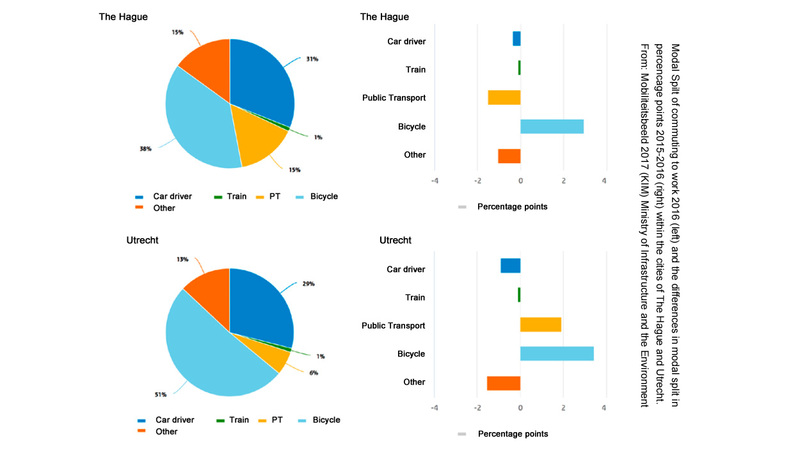 Comparing Utrecht (best of the four largest cities) and The Hague (third-best) the differences are stark for commuting by bicycle within the city. Utrecht has a percentage of 51% for cycling, for The Hague that is 38%. Going to work in a car (as a driver) is slightly higher in The Hague with 31%. In Utrecht that percentage is 29%. There is also a big difference in the figures for Public Transport (mostly buses in Utrecht and trams in The Hague). In the Hague 15% goes by public transport, for Utrecht that is just 6%. Cycling is increasing in both cities. In Utrecht with 3.5 percentage points, in The Hague with 3 percentage points. Graph: KiM. The Hague is trying hard to improve cycling. There is a website in English but that doesn’t mention the various routes that are being upgraded. The Dutch page does mention 5 of those star-routes, upgraded under the current cycle plan (that ends in 2018). It also mentions that the city has upgraded 143km of cycle path surface from concrete tiles to smooth red asphalt from 2006 to 2018. The total length of the cycleways in The Hague is 370km. The city has invested 13 million euro under the 2006-2018 plan, all to further improve and increase cycling. Since Ms Leafhuntress asked for people in suits: here’s the first of two fine specimen. The biggest project in that plan is still under construction and things don’t go very well. You can see it in the background in a few of the shots in my video. The station square is a huge building site. Early 2017 the construction of an underground bicycle parking garage started. When finished it will be able to park 8,500 bicycles here. Unfortunately, the opening has been postponed three times already, the last time indefinitely. The facility should initially have been opened in May 2018. The biggest problems are the underground connection to the station. The public tender for this sub-project has failed twice (meaning it was so expensive that the city now tries to find another solution). Another major problem is the fact that two 90-metre-tall residential towers are planned to be built on top of the facility. The foundations for these towers were integrated in the underground parking facility but the construction firm has not yet found a way to make it safely possible to build these two towers while the underground facility is already in use. Worst case scenario seems to be that the towers will have to be finished first, before the new facility can open. This could take years, the towers and the square are planned to be finished in 2021. The building site in front of the central station of The Hague (the blue fences in the distance). This is where an 8,500 places bicycle parking facility is under construction. There is a place to park bicycles in the meantime. The existing underground parking garage (where I got my OV-Fiets that day) and the so-called “Fietsflat”, a “temporary” steel bicycle parking facility for over 4,000 bicycles that was opened in 2015. The number of trams passing here was very high. All headed for or coming from the central station. There are traffic signals and very loud bells which were ringing so loud and so often that people seemed to ignore them because of their annoyance. 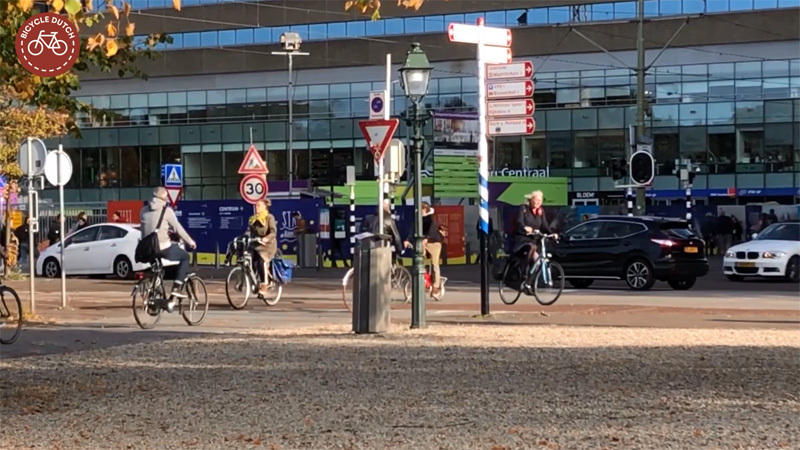 Watching people cycling in The Hague, this week’s video. * I was in The Hague because I was honoured with an invitation to a reception at the Australia Residence organised for a delegation visiting the Netherlands from Australia and New Zealand. Not only the Australian ambassador was there, also the ambassador for New Zealand. Nice article Mark! We are actually busy with designing a new lay-out of the bike infrastructure at the location you mentioned. It’s part of a bigger plan including the park “Koekamp” and the square in front of the station after the construction work is finished. The new lay-out has to accommodate the growth in bike traffic in general and specific the extra traffic from and to the new parking facility. It would be good if the traffic light engineers in Den Haag could learn from those in Almere, where the lights change to green as the back of a bus is level with it [having already passed amber] allowing immediate onward travel. That would also reduce the time for the ringing bells. Continuing bells would indicate a tram approaching from the opposite direction to warn people who are unsighted by the first passing tram. I ask for women in skirts (and high heels) 🙂 It seems to be especially shocking to people that women dressed like that can cycle. Indeeed, a photo of a women in skirt on a bicycle started the whole “cycle chic” movement. 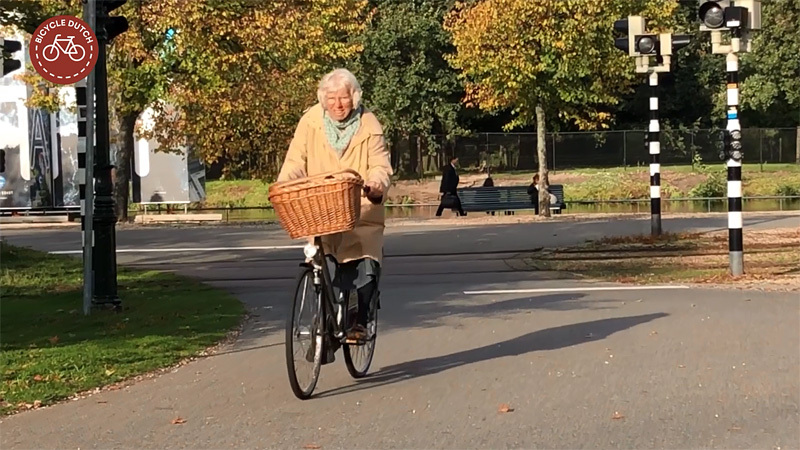 While photos of such women on bicycles can be found on said “cycle chic” websites, they’re not neccessarily showing them using high quality Dutch-style cycle paths, especially along main roads. 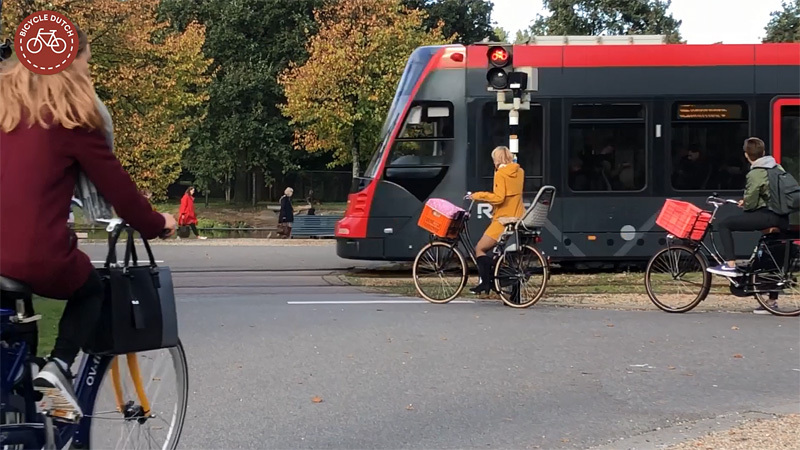 Such photos would promote two things at once: cycling for everyone and infrastructure which makes that possible. On the other hand, see cover photo of CEoGB Facebook profile: great infrastructure, but no people it’s meant for. Although I am reading your blog from New York City, I did spend many years living in the Hague. I was one of those many, many expatriates working for an international organization. I just wanted to thank you for providing readers with such detail and interesting statistics and information. I imagine that very work intensive for you to produce such an information-rich blog and I wanted to thank you for your efforts. Next time you plan a trip to the Hague let me know I still have some very good friends and family there I’m sure would love to host you. And, if you ever get to New York I will be very happy to share with you some of the bicycling infrastructure issues that we have here. It’s great to see you receiving international recognition! Certainly well deserved. I wonder where you would like to see it lead in the future. 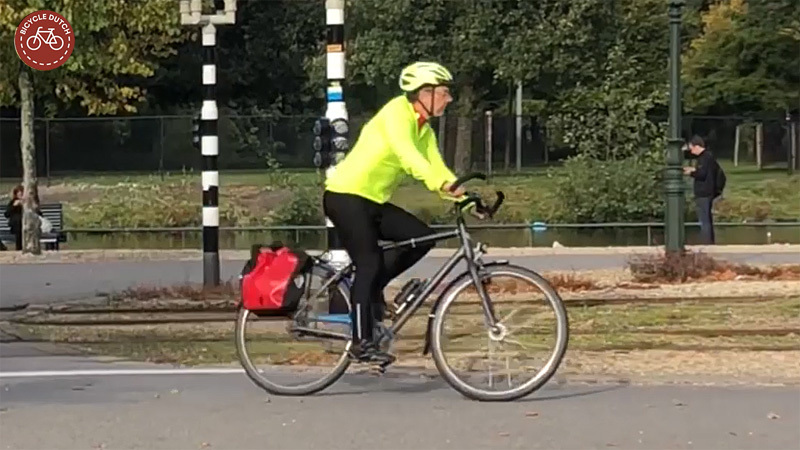 This entry was posted on 9 October 2018 by Bicycle Dutch in Original posts and tagged Den Haag (the Hague), watching people cycling.